Wild Boar Honda Pioneer 1000 (All Years) Xtreme Rear Bumper w/ LEDS $265.00 with Free Shipping! **Christmas Special** Wild Boar Honda Pioneer 1000 (All Years) Xtreme Rear Bumper w/ LEDS $265.00 with Free Shipping! 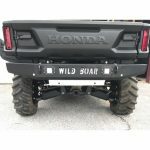 **Black Friday** Wild Boar Honda Pioneer 1000 (All Years) Xtreme Rear Bumper w/ LEDS $220.00 with Free Shipping! Wild Boar Honda Pioneer 1000 (All Years) Xtreme Rear Bumper w/ LEDS $240.00 with Free Shipping!